“Spillover” from certain co-workers can boost our productivity — or jeopardize our employment. The people we sit near at work inevitably impact our day. They may brighten our mood or drive us crazy. What’s more, our work neighbors can actually change how well we do our own jobs. Researchers looked at the 25-foot radius around high-performers at a large technology firm and found that these workers boosted performance in coworkers by 15 percent. That “positive spillover” translated into an estimated $1 million in additional annual profits, according to new research from Dylan Minor, an assistant professor of managerial economics and decision sciences at the Kellogg School. Of course, the flipside is that bad eggs impact their neighbors, too. Negative spillover from so-called toxic workers is even more pronounced — sometimes having twice the magnitude of impact on profits as positive spillover. Yet, while this toxic spillover happens very quickly, it also dissipates almost immediately once that worker is either fired or relegated to the far physical reaches of the company. Which means that companies potentially have a very cheap way to boost productivity — simply shift some desks around — as opposed to relying on expensive training and recruiting, Minor says. In an era where companies are experimenting with open floor plans and other nontraditional seating arrangements, the stakes can be high. Minor’s research provides tangible takeaways for leaders thinking about how to group their staff. “Companies are realizing that, ‘wow, spatial management really does matter. Let’s put some more work into thinking about how to do it well,’” he says. This research grew out of previous work by Minor and coauthor Michael Housman of HiQ Labs that focused only on toxic workers. Using data from consulting firm Cornerstone OnDemand, the researchers analyzed more than 58,000 hourly service workers at 11 well-known firms. They found that a toxic worker’s negative financial impact — $12,800 by their calculation — was far greater than the financial boost that comes from a superstar. Minor and Housman presented their findings to the firms involved. A technology company in California that was part of the study approached the researchers afterward and asked if they could drill down deeper into the data. How, the company wondered, did physical proximity impact spillover? “We’ve known since kindergarten that who you sit next to can matter,” Minor says. So what did physical proximity do when employees’ work was approached in a multidimensional way? To explore this, Minor and Housman got two years’ worth of detailed information on the performance of more than 2,000 workers at the tech firm. They picked two measures of performance — speed and quality — and gave workers a ranking of either high or low for each. They also defined toxic workers the same way as in their previous research, as anyone whose behavior was so bad that they were fired. Toxic workers ended up comprising about 2 percent of the workers studied. Then the researchers literally mapped out where each employee sat and analyzed how each person’s work shifted over time as their neighbors changed. Having a high-performing neighbor is a bonus for everyone. Employees who ranked high on either speed or quality boosted the performance of those within a 25-foot radius. The impact was particularly strong on those who were matched with someone who had a complementary skill. In other words, if Bill is rated high for speed and Bob is rated low, Bob’s speed will improve when he sits near Bill, more so than if they were both already speedy workers. The same holds true for quality. And, crucially, Bill’s speed will not be dragged down by his slower-moving neighbor. This idea of matching people with complementary strengths makes sense when the skill in question is something that has a finite upper limit, like speed, Minor explains. But for other skills, like creativity, where there is no true upper limit, it might make sense to pair people with the same strengths so that their positive spillover keeps nudging the other to do more and more creative work. Toxic workers are really, really toxic. And they infect their neighbors very quickly. Keep in mind how narrowly the researchers defined toxic — someone who is fired for their behavior. This means that simply sitting near someone who gets fired means you yourself are now more likely to commit an act heinous enough to merit firing. And this toxic spillover happens almost immediately. The researchers saw neighbors go bad, so to speak, as soon as that toxic neighbor showed up. Whereas positive spillover that boosted speed or quality generally took a month to impact a lower-performing neighbor. Why is negative spillover so much more powerful than positive? Minor believes it is line with many other psychological studies that show that, “negative effects have more of a magnitude than positive effects.” For example, losing $100 is more painful than winning $100 is joyful. Next the researchers explored why spillover happens. Are people learning good or bad behavior from their neighbors or is something like peer pressure at work? They reasoned that if employees were learning from those nearby, then the positive or negative effects would continue after their influential neighbor left. But the data showed that both positive and negative spillover were fleeting. While this is unfortunate for positive spillover — wouldn’t it be great if the improved employee continued being awesome forever? — it is good news in the negative department. “You could have this other kind of model where people learn how to become a criminal or a jerk and then they stay a criminal or a jerk,” Minor says. The researchers’ findings provide some tangible advice for managers. In addition to measuring spillover, Minor was interested to find that, at least among the hourly workers he studied, there really was no such thing as a worker who is highly skilled in everything. He advises leaders to think about what strengths they want in their employees and then narrow that down to the two or three most important ones. Then leaders should decide whether to pair people with similar or complementary skills near each other, based on whether the skills have an upper limit, like speed, or do not, like creativity. “You can actually measure a lot of this stuff and be pretty scientific about putting together an optimal spatial management of the organization,” Minor says. 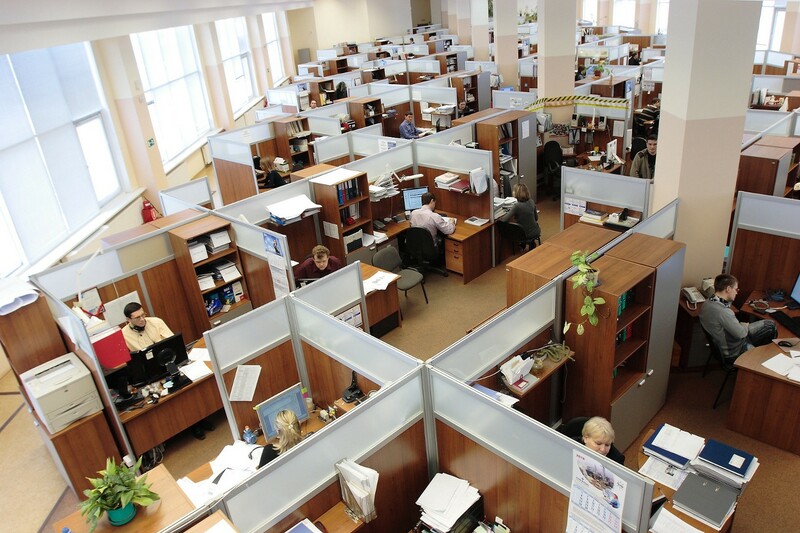 Yet much of the changes in office layouts have not been done scientifically. Minor is working with the same firm now to look at the pros and cons of open floor plans. Other offices are experimenting with different nontraditional seating, he says, like “nomad workers,” where people have no fixed desks and just roam around. By: Emily Stone is the senior research editor at Kellogg Insight. This article originally appeared in Kellogg Insight on May 8, 2017. Is ‘work-life balance’ a joke?